William Leopold Doak (January 28, 1891 – November 26, 1954) was an American Major League Baseball pitcher who spent 11 years with the St. Louis Cardinals. Doak was born in Pittsburgh, Pennsylvania. In 1914 he went 19–6 and lead the league with an ERA of 1.72. Doak won 20 games in 1920, and led the NL in ERA again in 1921. On June 14, 1924, Doak was traded by the Cardinals to the Brooklyn Robins for Leo Dickerman. He returned to St. Louis for a short time in 1929 before retiring. His lifetime record is 169–157, with an ERA of 2.98 and 1,014 strikeouts. Even though Doak played with many unremarkable teams, he is among the Cardinals' top 10 in eight pitching categories; his 32 shutouts rank second behind Bob Gibson. Doak's main pitch, the spitball, earned him the nickname "Spittin' Bill". 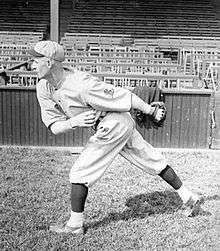 When the pitch was outlawed in 1920, Doak was one of 17 pitchers allowed to continue throwing the spitball. Doak made his most lasting contribution to baseball by innovating the design of the baseball glove. In 1920, he suggested to Rawlings that a web should be laced between the first finger and thumb, saying it would create a natural pocket. The Bill Doak glove soon replaced all other baseball gloves and is the standard to this day. Doak retired to Bradenton, Florida, where he owned a candy shop (Bill Doak's Sweet Shop), and also coached the Bradenton High School baseball team, which made it to the state championship. He died in Bradenton, aged 63.